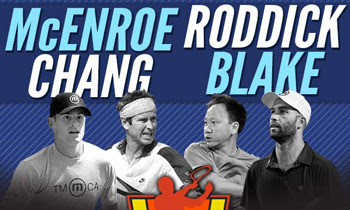 Don’t miss out on this opportunity to see four American tennis legends in action. Tickets start at $35. Play begins at 7:00pm on Wednesday, April 29th at Target Center. 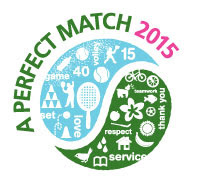 This gives you a great opportunity to support ICT while attending a fantastic tennis event. There are a limited supply of tickets and VIP packages, so go to PowerSharesSeries.com soon to get all the details and order your tickets… and be sure to use the INNERCITY code when ordering. Group discounts are available! Thank you! Purchase tickets here. 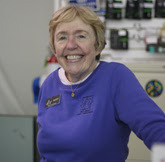 Have you wondered who is behind all the renovations at Reed Sweatt Family Tennis Center? Behind the scenes, a team of four outstanding volunteers have been working steadily since 2013 to manage this project. ICT is very honored to have worked with (pictured left to right) Steve Faber of Anderson-KM Builders, Dave Pelner of United Health Group, Chair of our Facilities/Real Estate Committee, Steve Bieringer of RSP Architects and Greg Huber of Mortenson Construction to design and oversee this multi-year, multi-million dollar project. 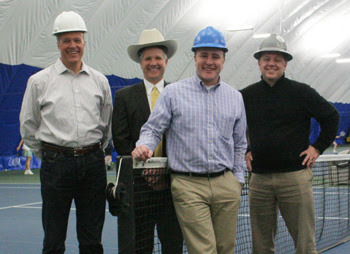 We thank this team of professionals who have invested hundreds of hours and inestimable talent in making Reed Sweatt the best public tennis facility in the Twin Cities. This team of four did not know each other prior to the start of this project and have collaborated to do outstanding work on behalf of the ICT organization. To read the Q & A with the “Fabulous Four” click here. 21st Century Classroom and Offices to be completed by end of May / Locker rooms contingent upon funding – Donate Today! As you have undoubtedly noticed, the lobby renovation is nearly complete. 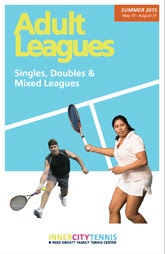 The TV will be installed on April 7 so that we can welcome the much-missed Tennis Channel back to our lobby. Target Commercial Interiors worked with us to select colorful and comfortable furniture to make the lobby much more inviting. What about the offices? 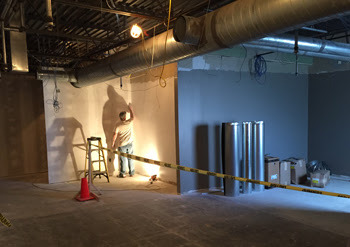 Belair Construction is working hard to renovate our office space and build the Best Buy 21st Century Classroom. We anticipate that this project will be complete the last week in May. In August, the facility will be closed on August 17 for two weeks to re-surface the courts. If we are successful in securing the additional $700,000 we need to completely pay for the Raise the Roof, Close the Gap project, we hope to renovate our locker rooms during that period. If you have not yet donated, or can make an additional donation, please do so by clicking here! 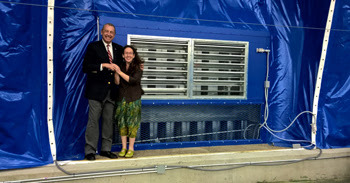 Inventor of air handling units likes what he sees at the Reed Sweatt Family Tennis Center! Ron Scharf, Chairman of Arizon Companies and inventor of the air handling unit that ICT installed, visited our facility on April 1. He made a close inspection of the units, liked what he heard and met with Samantha to discuss ICT’s youth programs, our place in the national network of chapters of National Junior Tennis and Learning and the prospects of future connections. It was a great honor for our team at ICT! Are you ready for summer tennis in our newly renovated facility, now with air conditioning! 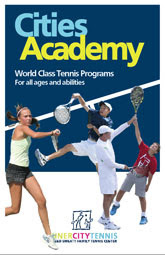 We have a full line up of programming options for Cities Academy juniors. For detailed program and registration information, click here. 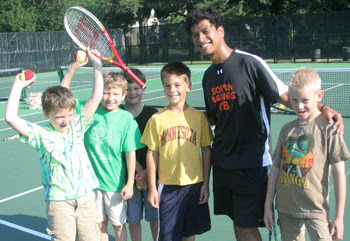 Our historic Summer Tennis in the Parks program will operate at 23 parks throughout Minneapolis from June 15 – July 17. Full scholarships are available for all families in need. For detailed program information and online registration, click here. ICT’s 2015 A Perfect Match gala will be held on Friday, October 9, at the Radisson Blu, Mall of America – a breathtaking event space. PLEASE circle this date on your calendar as we want this year’s event to be the best-attended in our 63-year history! 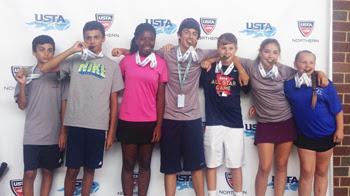 Summer Parks Coaches Wanted – Apply Now! 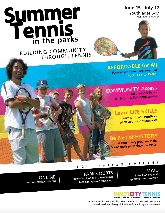 Each summer, ICT recruits and hires youth coaches to teach in the parks, nearly 75% of whom have grown up learning tennis in ICT programs. Did you know that many ICT youth coaches have gone on to serve on our team, including current staff members Taylor Hanson, Dilcia Pederson, Dylan Kelly and Andrew Siegfried? To apply to be a summer coach, click here. Today is Mary Baker’s birthday, the legendary mixer of the magical elixir, Nicollet Nectar. Happy Birthday Mary! 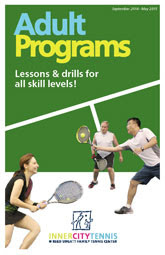 Physical Activity, Tennis & Life Skills delivered at no charge to hundreds weekly. Three sessions remaining before summer break. Join us on April 11th, 18th & 25th. Cost / Scholarships – $80, full scholarships available for all families in need. 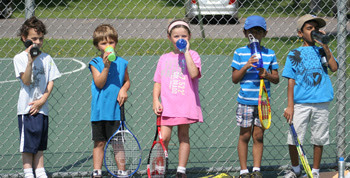 Junior tennis programs for all ages and abilities. Scholarships available. 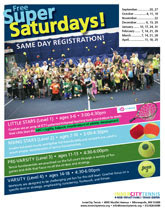 Information and paper registration available. Online registration open soon. Learn the basics and get playing the game! Still time to register for an April class! New sunrise drills have been added on Wed and Fri mornings. If you are a new league player or not sure of your rating, call the front desk at612-825-6844 to sign up for a rating session ($5). The Minnesota Twins recently recognized ICT board member Shelley Andrew as their Volunteer of the Year by presenting a $1,000 check to ICT. 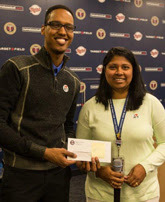 Shelley logged the most volunteer hours of any Twins employee. She is pictured above accepting the check with ICT Volunteer Coordinator Omar Warfa. Congratulations to Kirby Pitman – who is the winner of a new Babolat racquet! Kirby was randomly selected from a list of survey participants. ICT conducted a social media survey in March and is currently working with a group of students from the U of M to analyze results.